First grade at Ivy League is considered the heart of formal schooling. It is often the place where children form long lasting attitudes about themselves as learners. With too much stimulation, a child may become overwhelmed and tune out; too little and the child quickly becomes bored. First grade is also the time when children begin to become increasingly independent. Our first graders learn to apply their organizational skills, manage their learning tasks, and work productively with their peers. Several factors contribute to a successful first grade experience at Ivy League: high expectations for student achievement, constant monitoring of progress and frequent parental contact. At Ivy League, a low student-teacher ratio and the presence of teacher assistants ensure that your child’s first grade experience will be personalized. In this small setting, the teacher is able to assess each child’s development and academic level, identify reasonable expectations, apply appropriate teaching methods, gauge progress and provide frequent feedback to parents. Moreover, because our school maintains a flexible schedule, the teacher can spend as much or as little time on what is necessary to learn and what is interesting to children. The goal of our first grade language arts and literacy program is to develop children’s love of language and their proficiency as readers and writers. Formal reading instruction is provided in a small group setting where lessons are differentiated according to children’s abilities. Grouping is flexible, allowing children to progress quickly or remain at the same level if need be. Texts are leveled in a gradient from A to Z, with much thought given to what the reader needs to be able to do to advance to the next level. Every day each child receives direct instruction, reads around the room, partner reads, and reads independently from books which appeal to his or her interests. Children learn to identify examples of literary terms such as “character,” “main idea,” and “plot.” By the end of first grade, our young students are able to handle a variety of reading genres, apply complex phonetic principles and talk about books and authors. 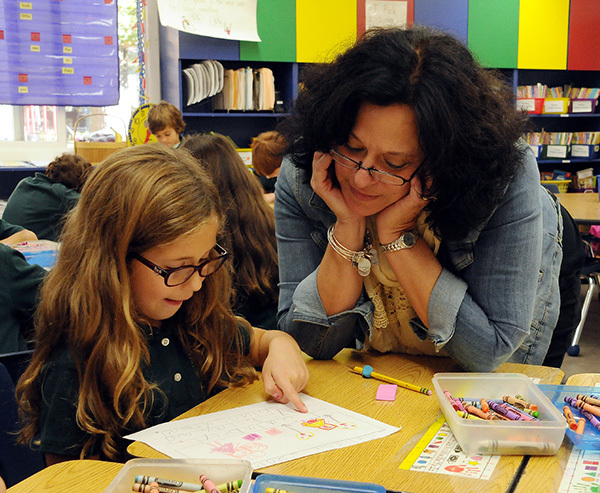 Communicating in writing is an essential component of Ivy League’s first grade curriculum. To develop strong writers, we combine two frameworks: “Writer’s Workshop” which follows the writing process of pre-writing, drafting, editing and revising, the process many writers follow naturally; and the 6+1 Traits of Writing framework which breaks down the complex process of teaching writing into manageable chunks, including ideas, organization word choice, conventions, fluency and presentation. In Writers Workshop, children write for a number of purposes and forms. They respond in writing to text they are reading, write a simple opinion piece, or let their imaginations flow as they compose original stories. 6+1 Traits gives the class a common language for talking about elements of writing and provides the teacher with a tool for assessing progress. The content of our Math program correlates with New York State standards and follows the National Council of Teachers of Mathematics recommended content emphasis for first grade. Our curriculum’s focal points include developing understandings of properties of numbers and operations, attributes of dimensional shapes, measurement, simple statistical concepts and of numbers such as odd, even, etc. Drill and practice along with mental math are used to increase fluency and accuracy in computation. Math center activities provide for differentiation among learners. Our first graders learn to apply their literacy skills to better understand and explain their understanding of history, geography, economics, government and citizenship as it pertains to our country. Appropriate content knowledge helps children gain an appreciation of the United States and its history. Children compare life today with life in the past using our local Long Island community. In geography studies, children learn to distinguish features of maps and globes and the physical features of our country beginning with the vast shoreline of their own environment. A wide variety of primary sources including field trips, guest speakers, photos, literature and internet access make the past come alive and the present, more real. A significant shift takes place in science education during the early grades as students experience two approaches to scientific inquiry. In the first instance, they follow traditional steps used in investigations. With the help of our dedicated science teacher, students are presented with a set experiment to demonstrate a principle related to the earth, physical or life sciences. Ivy League’s first graders apply the traditional scientific method to observe purposefully, collect data and report their findings. The emphasis is on describing cause and effect relationships. In a second approach, more like the way engineers work, students identify a current problem in their environment and proceed to use simple scientific principles to design or build a model of a possible solution. Each year, our young students participate either in developing an original science fair project to demonstrate their understanding of the scientific process, or in our invention convention which promotes creative and original thinking requiring a final product or design.